BERINGER wheels are very often sold with a tire mounted and pressure tested by our team, to ensure the highest level of safety. The choice of tire is made depending on the aircraft specifications (max load and outer diameter), on the rim diameter and the type of use (flight school, bush, standard, ...). For every size we try to propose two qualities and two different brands, depending on your needs. All the tires are mounted in tubeless (except 200x20), for the non certified aircraft it can happen that the required sizes do not exist in tubeless, therefore we mounted tubetype tires in tubeless, after long and multiple tests to make sure that they hold air perfectly. Please note that sizes and weights can vary from one batch of production to another, do not hesitate to contact us for any advice or inquiry. 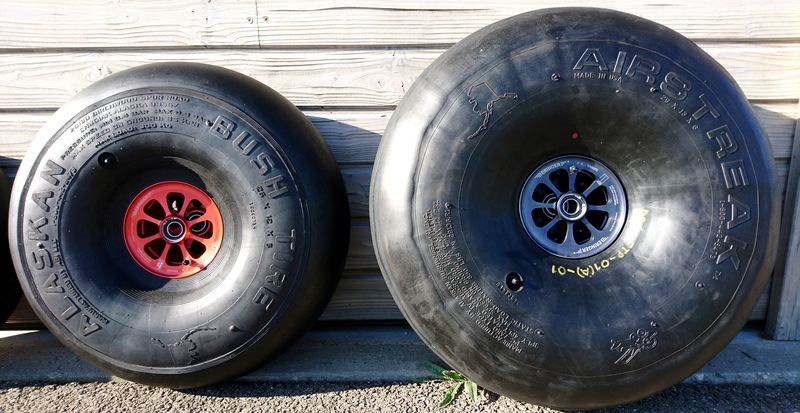 In partnership with the leaders of the bush tires in Alaska, Airframes Alaska, we have developped the Alaskan Bush Tire range, especially designed for ultralights and light sport aircraft. The Alaskan Bush Tires feature a weight saving, a higher flex and absorption compared to the standard range (Airstreak or Alaskan Bushwheel).